It was miserably cold, breezy and damp for most of the afternoon in Waco. But the last football game ever played at Baylor’s Floyd Casey Stadium was worth the discomfort. Before settling down into a defensive battle, the semifinal game between Lake Travis and Cedar Hill looked like it was going to be a shootout. On their opening possession the Longhorns had little difficulty moving the ball, scoring on a 3 yard slant to receiver Damarkus Lodge, a missed PAT made the score 6-0. The Cavaliers came right back scoring on a beautiful 43 yard run by Dominic De Lira. Lake Travis 7-6. That would remain the score until halfway through the 3rd quarter when the Cavs would add to their lead with a 40 yard field goal making the score 10-6. More than the score, things really looked like they were going in Lake Travis’ favor. Between miscues, the weather and Lake Travis’ defense, the Cavs were winning the field position battle. While only a four point game, the Longhorns looked to be hanging on by a thread. Cedar Hill took possession on their own 9 after a LT punt and quickly moved the ball to midfield on inside runs by Cedric Ware. For the first time today the sun came out, the biting cold lessened and the Longhorns found their stride. Pounding the ball with running back Larry Hill and Ware, Cedar Hill moved the ball to the Cav 11. An alley oop to Lodge and the ‘Horns took the lead 13-10 with 4:51 remaining. A Cavalier four and out was quickly followed by a touchdown run by Ware to make the final score 19-10 Longhorns. Again, I was amazed by the talent of big school Texas high school football. The teams that manage to survive through four playoff rounds just have unreal talent. Lake Travis is an outstanding team and played well enough to win a state championship in most any other state, but here they fell in the semifinals. Looking at some other scores from around the state, I’m sure the same could be said of other 4 and 5A losers. 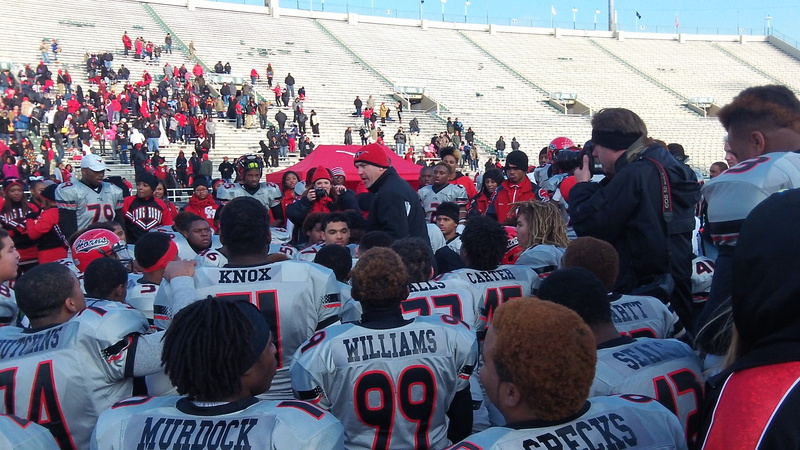 The Longhorn win sets up a championship rematch between Cedar Hill and Katy from last year. With narrow victories Saturday, Aledo and Stamford also advanced to the finals, making four programs I wrote about last season will be playing in AT&T next weekend. The one sad note for me was that the Port Lavaca Calhoun Sandcrabs fell to Brenham. Even getting to the semis is a great season, but I’m disappointed I won’t get to see them play.